I don't even remember if we knew that Lemon Twist was the official name of the thing (scroll down in this link for more). 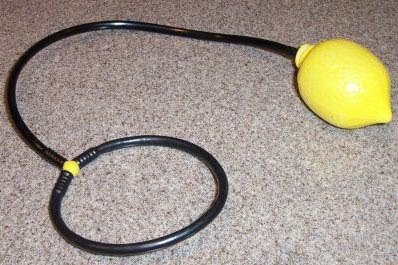 It was uber-simple--a yellow plastic lemon on a cord that ended in a loop you could wear around your foot. You stepped into the loop and swung the lemon around and under your foot, hopping like a maniac to jump over the lemon and avoid having it slam into your ankle. That was...pretty much it. I'm not even sure why it was a lemon. Why not a lime, or an apple, or a rock? Why a fruit at all? But for a short time in the 1970s, Lemon Twist was the hot playground accessory. I never heard of this competing version, Skip It, but its main selling point seems to be the counter that tells you how many times you've swooped it. Not sure why this would be of interest. And a 1960s version, the Jingle Jump, apparently inspired its own record. Did you have a Lemon Twist, or a competitor? (Was it a girls-only thing? It was at my school.) Do you remember it fondly? I never heard of the other two, but there were definitely lots of Skip-Its around growing up! Now they light up... but I'm still not very good at them. The last time I visited my grandmother (last month), she said "I found one of your toys! You loved this thing...played with it for hours." I didn't bother pointing out that I played with it for hours because they live in the middle of nowhere, there were three TV stations (including PBS) but I wasn't allowed to watch TV anyway, and the youngest people I knew were doing their blue rinses or plowing fields. I had a "Footsie," same concept, but not shaped like a lemon. Me too, LI Laura - I think there was a red plastic bell on the end. I remember the commercial "Footsieeeee yeah! Everybody's having fun." And we did! I not only had an actual Lemon Twist, but my neighbor-friend did too. My chief memory of the thing is the two of us swooping together on the driveway. My mom just found out today that this same friend died suddenly of cancer over the summer. The timing is totally random, but the "remember when" does make me smile. Had one of these in 1st grade (1975-1976). The macadam eventually wore a hole in the lemon. It was a good form of exercise.